Tuesday March 3- 1931 I worked on the rug in AM. Hattie here in PM and we went up town to see "Cimmeron" Cora & Mrs Barber there she brought me home. Wrote Blanche Black & read in the evening Wednesday March 4- 1931 I did more washing and went to The Church by Bus before eleven oclock. Mrs Miller brought me home at four oclock. Letters from Millie and Mrs Falk Wrote Ott Seibert and sent Blanche Blacks letter. Read most of the evening. 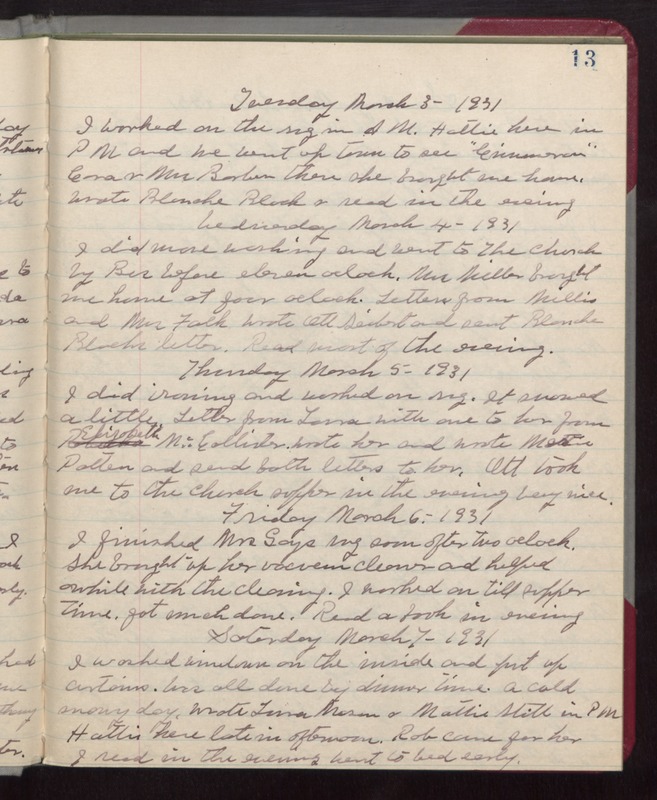 Thursday March 5- 1931 I did ironing and worked on rug. It snowed a little. Letter from Laura with one to her from Elizabeth McCallister. Wrote her and wrote Mattie Patten and send both letters to her. Ott took me to the church supper in the evening Very nice. Friday March 6- 1931 I finished Mrs Gays rug soon after two oclock. She brought up her vacuem cleaner and helped awhile with the cleaning. I worked on till supper time. got much done. Read a book in evening Saturday March 7- 1931 I washed windows on the inside and put up curtains. Was all done by dinner time. a cold snowy day. Wrote Laura Mason & Mattie Stitt in PM Hattie here late in afternoon. Rob came for her I read in the evening Went to bed early.